It felt a little strange to be ending the FIA GT season at Oschersleben. It has been a short year for the Spirit Kia-backed Balfe Motorsport team, but the next level of competition has been just what it needed and it has definitely been able to raise its game on the international GT stage. The Oschersleben weekend went really well for the whole team, especially as it was effectively starting from scratch. Jamie Derbyshire and Shaun Balfe both went for a run around the circuit on Thursday evening, and even the lads in the team took a walk round on Thursday afternoon, to get some idea of what might be needed set-up wise. The free-practice sessions went really well. Both drivers got up to speed very quickly, with only a handful of laps required before they were where they needed to be. Shaun Balfe soon found that any chance of being closer to the GruppeM cars was out of the question though. With both Jamie and Shaun quicker than the relative pairings behind them on the grid, it was a case of concentrate on race set-up and see where the three-hour race led. The Mosler has performed faultlessly since Magny-Cours, and with the GruppeM cars suffering from the occasional mechanical problem over the first half of the year, a surprise result was always a possibility. Shaun managed to put the Mosler third on the GT2 grid, just over a second away from the Lieb / Rockenfeller car and comfortably ahead of the Ebimotors Porsche behind. The start of the race might have caused a few problems when Shaun set off on the green flag lap and found that he couldn’t see the start lights, as the Mosler was lower than the roofline of the Porsche in front of him! Team manager Simon Ranyard had to give a radio signal when the lights went green, which actually worked out better for Shaun than expected, as it seemed the GT1 Saleen in front of the Rockenfeller Porsche also couldn’t see it and the Mosler was able to power past into the first corner. The glory was to be short-lived, though, as by the end of the opening lap Shaun was back in third, but pulling away comfortably from the cars behind, and settling in for his long opening stint. The first hour of the race went by really quickly for the team and with no dramas the first pit-stop to hand over to Jamie went very smoothly. As the team watched the GruppeM cars make contact with each other, it looked like a surprise win might even be on the cards. However, from mid-way through the race Jamie started to encounter a problem. A slightly sticking throttle was causing some understeer in certain sections of the track. Jamie came on the radio and warned the team about it, but carried on and his lap-times didn’t drop off, so he had everything under control. With just a handful of laps left in his middle stint it happened again, at just the place he didn’t need it, as he entered the fast chicane: the resulting understeer meant that a swift trip across the gravel was unavoidable. Jamie was straight on the radio to tell the team, but the car seemed ok, apart from a lot of stones gathered underneath, so the team kept him out up to the end of his run, and gave the Mosler a check over as Balfe climbed back aboard. Shaun immediately radioed in on his first flying lap to report that the throttle was still giving the same problems, but that he thought he could drive around it for the final 25-minutes of the race. The team was discussing what might have been causing the problem, but without stopping the car and losing time there was no real way of knowing. It was thought that rubber pick-up was probably the most likely cause, as there had been a lot of that during the course of the weekend. As the car was basically running fine, team and drivers decided to maintain their two-lap lead over their nearest challenger and get to the chequered flag. “The car was great when I first went out,” said Jamie. “I got straight into a rhythm and was able to hold the lead that Shaun had built up quite comfortably. The problem just started without warning and I was kind of able to pre-empt when it was going to do it. But unfortunately it just caught me at the wrong point on the track and the gravel was the only real option open to me! “The car felt fine afterwards, so it obviously didn’t do any damage, it was just a little bit tricky to drive in places, but we had a good cushion over the guys behind us, so we weren’t worried,” he said. Shaun was able to stay at a pace that kept the lead intact and the final race of the year for the Spirit Kia Mosler would result in a third place finish in GT2, with another ‘G2’ class win. The whole team has enjoyed this year in the FIA GT Championship. The organisers have been so helpful and the level of competition at the front is extremely high. There’s definitely a certain amount of pride that the Balfe squad has been able to step up to the international arena, and has been somewhat of a thorn in the side of the front running GT2 team from the start of the year. By the time the timetable too the entrants to Brno the rest of the teams had started to pay more attention to the Spirit Kia Mosler. Despite not being in a points-scoring position, the GruppeM team was certainly aware of the cars presence on the GT2 grid. “It was nice to see at Brno that the GruppeM drivers were taking us seriously when Tim Sugden acknowledged that he had qualified fourth, including us in the GT2 category. I know that we haven’t been taking points off them, but to be acknowledged as a car to beat on the track is the next best thing,” said Shaun Balfe. After dramas at the opening two races (Monza and Magny-Cours), the Spirit Kia Mosler has finished second, third, second and third in ‘GT2’ at Silverstone, Imola, Brno and Oschersleben – and has of course won the G2 class on every occasion. 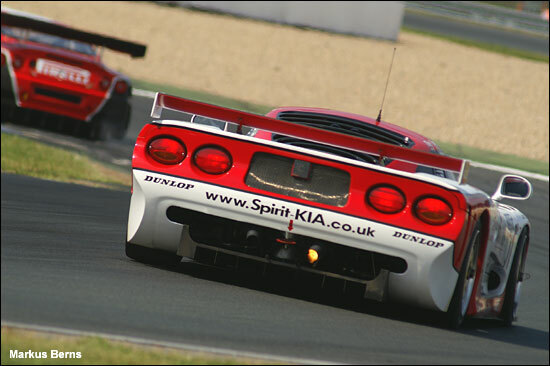 The two drivers still have a Mosler race to come – the Britcar 24 Hours, on September 10-11.